Hong Kong’s stratospheric property prices are pushing some residents beyond the law. A small, but significant, number of younger people are living in industrial buildings, trading comfort and convenience for cheap rent. Along with irritations such as rust-tainted water and intermittent blackouts, there’s one major drawback: Such living arrangements are illegal. It’s a risk 32-year-old photographer Wah Lee is willing to take. 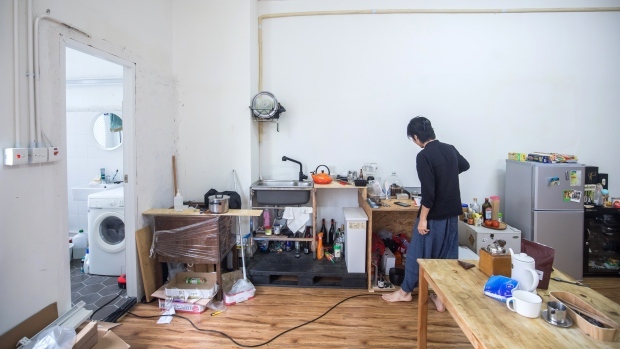 While he shares his building near the Sha Tin racecourse with a Chinese herbal-oil storage unit and a commercial kitchen pumping out roast meats, he and his roommate pay about HK$11,000 (US$1,400) a month rent, less than half what a residential unit in the area goes for. Along with a small kitchen and private bathroom, the 1,000-square-foot apartment features high ceilings and large windows, unusual by the standards of Hong Kong’s often poky apartments.